Heat the extra virgin coconut oil in a saucepan over medium heat; cook the onion and garlic in the hot oil until soft, about 5 minutes. 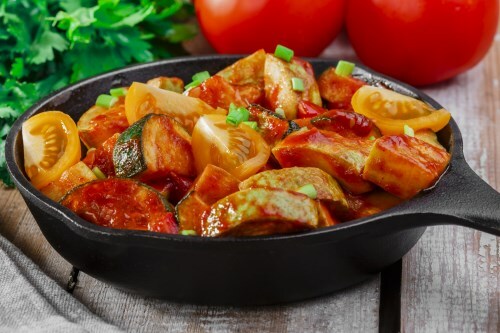 Add the zucchini slices and stewed tomatoes and stir gently. Cover and cook until the zucchini is tender, 8 to 10 minutes. Remove from heat, season with salt, and add the Cheddar cheese; allow to sit until the cheese has melted.